Tropical Depression 10W strengthened since July 4 and by July 5 had attained typhoon strength. NASA-NOAA's Suomi NPP satellite flew over Typhoon Maria on July 5 at 0348 UTC (July 4 at 11:48 a.m. EDT). The Visible Infrared Imaging Radiometer Suite (VIIRS) instrument aboard NASA-NOAA's Suomi NPP satellite captured a visible image that showed the center of Maria had moved to the west of Guam, and a large band of thunderstorms wrapping into the center and extended to the east, stretched over the island. A Flash Flood Watch remains in effect through Friday morning, July 6, for Guam, Rota Tinian and Saipan. When Maria passed over Guam it brought heavy rain. The heavy rain threat continues for the Marianas and excessive rainfall and flash flooding remain possible especially across Guam and Rota. Many locations across Guam already received over 3 inches of rain. In addition, The National Weather Service in Tiyan has issued a Small Craft Advisory, which is in effect until 4 p.m. CHST (local time) on Friday, July 6. 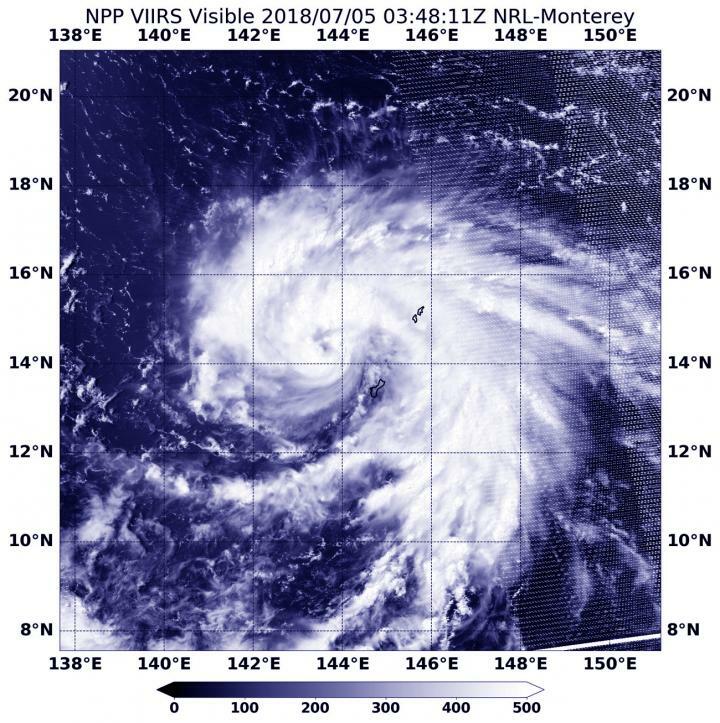 At 5 a.m. EDT (7 p.m. CHST Guam local time/0900 UTC) the National Weather Service in Tiyan, Guam reported the center of Typhoon Maria was located near latitude 14.9 degrees north and longitude 143.2 degrees east. That's about 145 miles northwest of Guam and About 170 miles west of Saipan. Typhoon Maria was moving toward the northwest at 9 mph. It is expected to make a turn toward the north-northwest with a slight decrease in forward speed over the next 24 hours. Maximum sustained winds have increased to 80 mph. Typhoon force winds extend outward up to 25 miles from the center. Tropical Storm force winds extend outward up to 140 miles north of the center and up to 70 miles south of the center. Typhoon Maria is forecast to continue to intensify through Friday.